Experience more than a museum at The Works: Ohio Center for History, Art and Technology, central Ohio’s best destination for hands-on history, art, science, and glassblowing. Why do families love The Works? Kids get to build, create, invent, and laugh (a lot!). Hands-on exploration is what The Works is all about. Learn science through doing in The Works discovery stations. And, there’s a special lab just for those 6 and younger. 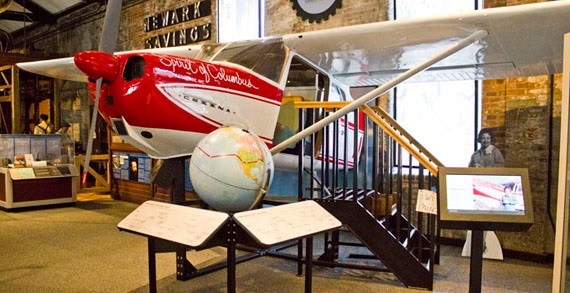 Connect with local history and climb aboard a vintage Cessna (outfitted like the one flown by Ohio’s own Jerrie Mock—first woman to fly solo around the world) and then try your skills at a flight simulator. Also, imagine life in an earlier era at a restored Interurban Railway Car and Ohio and Erie Canal Lock. Fire up your imagination as you view the work of regional and national artists in The Works gallery. Plan your discovery today. What could be cooler than hosting your birthday at The Works? 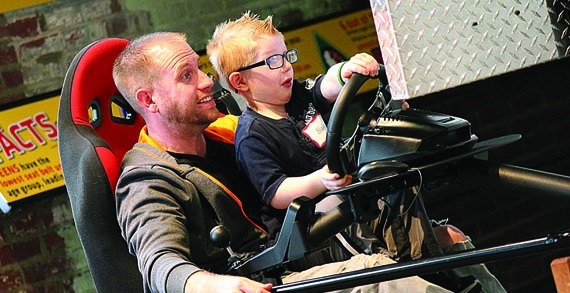 Build a racecar, try a flight simulator, and get hands-on in the science labs. Cost: $12 per child/$8 per child members. Add-on a fun activity to make your party extra special. In addition to all of the benefits of a Museum Party at The Works, enjoy a 30-minute activity for all children during the first or last 30-minutes of party rental. The Works: Ohio Center for History, Art & Technology is central Ohio’s best destination to experience hands-on family fun with history, art, science, and glassblowing. Hands-on exploration is what The Works is all about. Learn science through doing in The Works discovery stations. Build a race car and race it in the Go Lab. Take apart a computer and build something new in the Invent Lab. Meet a 13,000 year-old mastodon and discover his fate in the History Exhibits, or try your hand with a flight simulator and learn about Jerrie Mock, Newark native and the first woman to fly solo around the world. And, The Works has a special lab just for those six and younger. Stop by a daily glassblowing demonstrations, or pre-register to make your own glass with help from a professional glass artist. The Works is easy to get to – only 35 minutes from Easton Town Center.